Robert Downey Jr. stakes a claim as a serious actor in David Dobkin’s family and courtroom drama “The Judge” and thanks largely to past master Robert Duvall he makes it. It’s a familiar tale. The two stars play father and son in the legal profession, one a long-time honourable member of the bench in a small Indiana town, the other a sleek and cynical big-city attorney. Although they have been alienated from one another for many years, when the Judge is accused of murder, the son returns to defend him. The script by Nick Schenk and Bob Dubuque is polished to a fault. Workaholic Hank Palmer defends wealthy criminals without qualm, loses his wife to another man but dotes on his young daughter, and goes home to see his father only reluctantly when his mother dies. The Judge rules his local roost, tolerates his middle son’s return with impatience, bosses about his other two grownup sons and grieves quietly for his late wife. Only when police allege that the old man has run down and killed a man he once sent to jail for murder does the film begin to peel back the family’s secrets. Much of it is conventional with the paradox of a small town that is bucolic but also home to venomous rednecks and a police force that ignores 40 years of service by the judge and rushes to judgment. 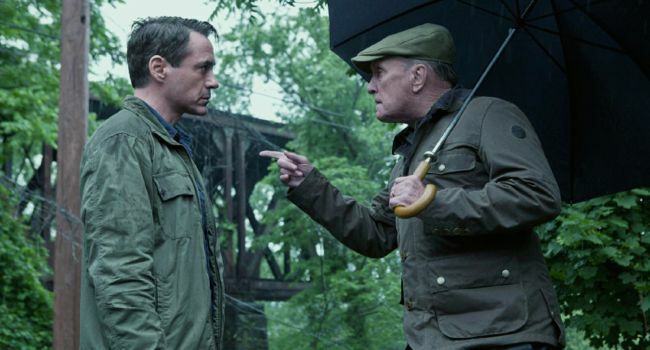 The dialogue is no more than adequate but Duvall, who has been playing angry fathers since “The Great Santini” in 1979, and Downey Jr., who adds thoughtfulness to his nonchalant charisma, raise it to a higher level. Their encounters are at the heart of the film and make it well worth seeing. Vincent D’Onofrio, as the patient elder son Glen, and Jeremy, as the slightly addled younger one, Dale, give heft to sketched characters. Vera Farmiga, as Samantha, the inevitable high-school sweetheart who never left town, is typically effective if a bit too glamorous for the role while Leighton Meester makes the most of her brief appearance as Samantha’s frolicsome daughter. Billy Bob Thornton is almost too shiny to be sinister as the aptly named special prosecutor Dwight Dickham. Shot in Massachusetts, “The Judge” lacks any feel of Indiana although production designer Mark Ricker’s courtroom, local diner and family home fit the bill. Janusz Kaminksi’s cinematography and Thomas Newman’s orchestral score are almost too lush and in his desire to add depth to the picture, director Dobkin indulges several nostalgic scenes whose loss would in fact make the film more substantial. Venue: Toronto International Film Festival. Release date: US Oct. 10, UK Oct. 17, Warner Bros. Cast: Robert Downey Jr., Robert Duvall, Vera Farmiga, Vincent D’Onofrio, Dax Shepherd, Leighton Meester, Billy Bob Thornton, Grace Zabriskie. Director: David Dobkin; Writers: Screenplay by Nick Schenk and Bill Dubuque, story by David Dobkin and Nick Schenk; Director of photography: Janusz Kaminksi; Production designer: Mark Ricker; Music: Thomas Newman; Editor: Mark Livoisi; Producers: David Dobkin, Susan Downey, David Gambino. Production: Warner Bros., Big Kid Pictures, Team Downey. Rating: UK 15, US R; running time: 141 minutes. This entry was posted in Film, Reviews, TIFF Toronto International Film Festival and tagged 'The Judge', Leighton Keester, Robert Downey Jr., Robert Duvall, Thomas Newman, TIFF, Toronto International Film Festival, Vera Farmiga, Warner Bros.. Bookmark the permalink.